Leave No Trace principles are based on practices which minimise impact on the environment and are also respectful to other visitors. Twenty-one years ago, I spent almost a month learning about Leave No Trace and minimum impact camping with the Wilderness Leadership School. The lessons we were taught were decades ahead of their time. We were also challenged to think about how the principles could be extended beyond the wilderness into our everyday lives. Everything from food waste to single use plastic – plastic straws were the enemy – were brought to our attention and discussed. Our stay in the wilderness was quite extreme in many ways. 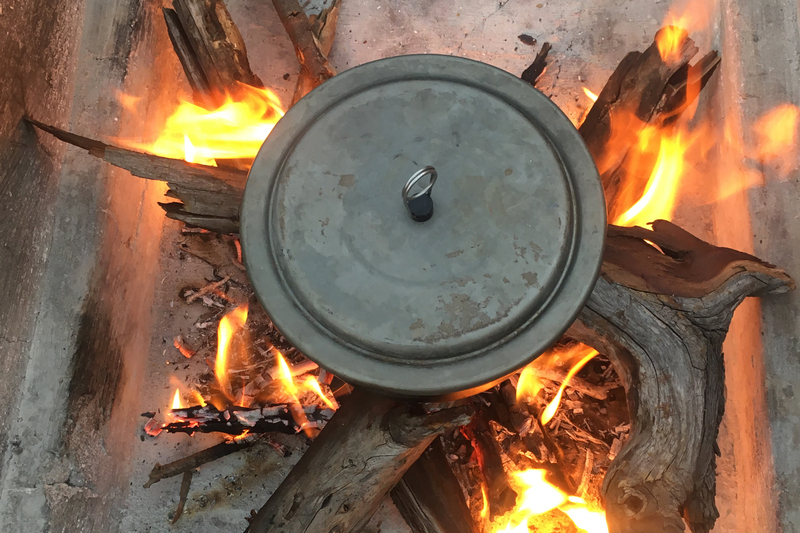 We weren’t allowed to use toilet paper – unnecessary, have watches – we didn’t need to know the time, when were hungry we ate, tired, slept, and our campsites were returned, meticulous, as if we had never there. Grass was fluffed like a pillow and there was an intricate method of removing any signs of the campfire which had been built on a bed of sand so not to scorch the earth. Reflecting on my experience with the Wilderness Leadership School it made a huge impression on me and my life thereafter. I began to refuse unnecessary items, question whether I needed things and insisting on reusing. I embarrassed friends by doing really weird stuff, like taking a Tescos bag and using it in Morrisons, years before the bag for life was a concept. Since my time with the Wilderness Leadership School, travels in the United States have further increased my understanding of Leave No Trace. In the US they are way ahead of us in the UK and rest of Europe in Leave No Trace practices. Now, whilst working in the outdoors in the UK, I try to teach many of the things I learnt with the Wilderness Leadership School and in America. As more and more people enjoy spending time in the wild places of the UK, to get away from hectic lives, slow down, connect with nature and enjoy the many health benefits associated with spending time in the outdoors, education on how visitors can protect and preserve the wild places we love is ever pertinent. Our use of wild spaces is also evolving which throws up new challenges and debates and, again, education, is key. In this article I detail eight practices, some of the old and new, which can contravene to Leave No Trace principles and try to provide solutions so that we can enjoy the outdoors without harming it environmental and destroy what we value about it. Campfires define a camping experience for some people. I completely understand this, I love a campfire too. However, collecting firewood can result in damage to trees and areas scavenged of dead wood remove critical habitats for invertebrates. In addition, fires can impose a wildfire risk, abandoned fires rings are unsightly and flames scar the ground. To follow Leave No Trace principles wood should be sourced responsibly and all evidence of a campfire should be removed before leaving. Wood should always be deadfall and people should consider bringing sustainably source wood with them if a commonly used area. Once finished a campfire should be thoroughly extinguished and any fire circles dismantled. This is simple enough to do, but what about preventing campfire scars in the ground? Well there are a few options depending on the environment. Take a look here. Like all Leave No Trace practices it is important to plan ahead. If you feel you will cause damage, even temporary, then refrain from an activity. Take a stove to cook on as an alternative or back up option. Keep campfires small, supervised and under control. Learn suitable methods to minimise campfire impact such as the ‘mound fire’ method. Refrain from any campfires during high fire risk periods or if permanent signs of a fire are unavoidable. Human waste is both revolting to come across and a potential environmental and health hazard. In mountain environments the nutrient rich nature of human waste changes soil composition and consequently what grows there. If you have ever found stinging nettles growing behind a rock on moorland it’s probably because people have been going to the toilet there. In the most sensitive areas of the UK, such as the Cairngorm plateau, a scheme is in place to pack out the poo. This scheme was introduced in response to issues caused by human waste from snowholing. However, when you have got to go, you’ve have got to go. So, let’s talk about how to minimise its impact. Human waste for environmental reasons, as well as for the sake of subsequent visitors, needs to be well away from streams and lakes, paths, the base of routes and faeces needs to be buried, making a pile of stones over isn’t appropriate. If going for a wee the same needs to be done and any toilet paper either needs to be buried or brought out with you (carrying nappy sacks are a simple solution). Avoid using wet wipes as these can contain plastic which doesn’t biodegrade. All sanitary items should be bagged and brought out. Make sure you go before you go. If wild camping, take a lightweight camping trowel. Metal trowels are much easier to dig hard and stoney soil than plastic ones. Take nappy sacks with you to pack out toilet paper and sanitary items. If you need to go make sure it is well away from water courses, buildings, the base of crags and paths. Stacking rocks and leaving painted stones in places has become a popular pastime of late. They are an artistic expression in nature and can involve a lot of skill. They also have the benefit of encouraging people, and especially children, into the outdoors. However, there are some ecological and, in the case of archaeological sites, archaeological impacts of these activities. Rock-stacking in water courses can disrupt habitats for invertebrates and damage to archaeological sites could occur if stones are moved. Beyond this the impact is that on subsequent visitors which I’ve written about in depth here. I personally have no problem with the act of rock stacking or painting the odd stone, the problem comes when they are left behind. When doing so it changes the feel of a place and removes the experience of wildness for subsequent visitors. After constructing a rock-stack or taking a painted stone to a place, take a photo and then dismantle it or bring the stone home with you for the mantle shelf. If you want to make a rock stack do it in a non-ecologically sensitive area and then dismantle it afterwards. Take a photo of your painted rock in a nice place and then take it home with you. Part of the Leave No Trace principles is to respect other people visiting wild places. Many people go to wild places to escape the stress of everyday life, one of which is background noise created by people and urban landscapes. With music on our phones and small speakers it is ever easier to take play music anywhere. Even shouting by others or phones ringing can be obtrusive to others. On still days noise carries surprisingly far. You may feel like you’re in a secluded wild camp spot, and although it is out of sight it may be heard from far away, disturbing others. Also, shouting, or anything that sounds like a whistle, can be interpreted that someone needs help and the rescue services alerted. Keep noise to a minimum, don’t shout or play music. Consider devices and technology which makes noise and try to reduce it or refrain from using it. Turn phones to silent and be considerate of the use of other technology like drones. If you do want to listen to music take headphones. Conduction headphones are best as you can still hear what’s going on around you. 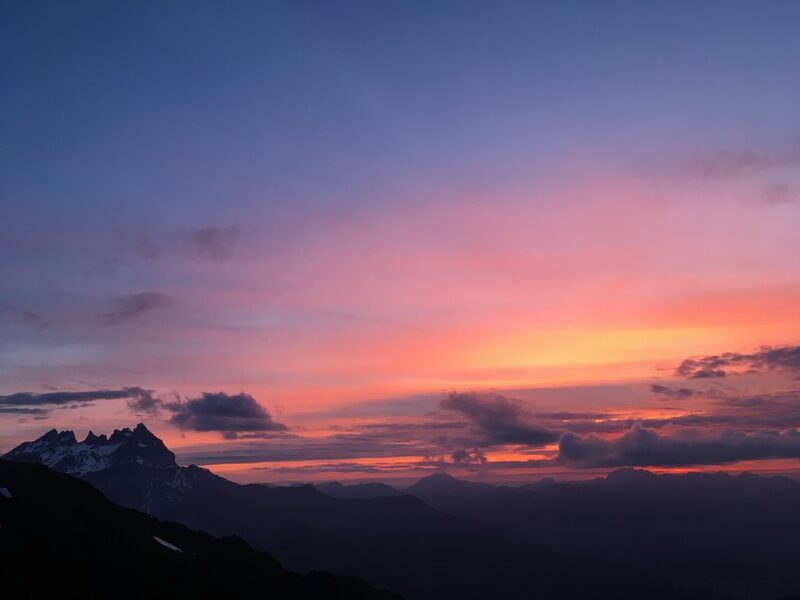 For many of us the mountains are our favourite places, so it is not surprising that the we or our loved ones would wish to immortalise people with a plaque on their favourite mountain or have their ashes spread on a summit. On well-known mountains scattering of human ashes has become a recognised problem. I personally nearly sat in a pile of ashes on the summit of a Lakeland peak. 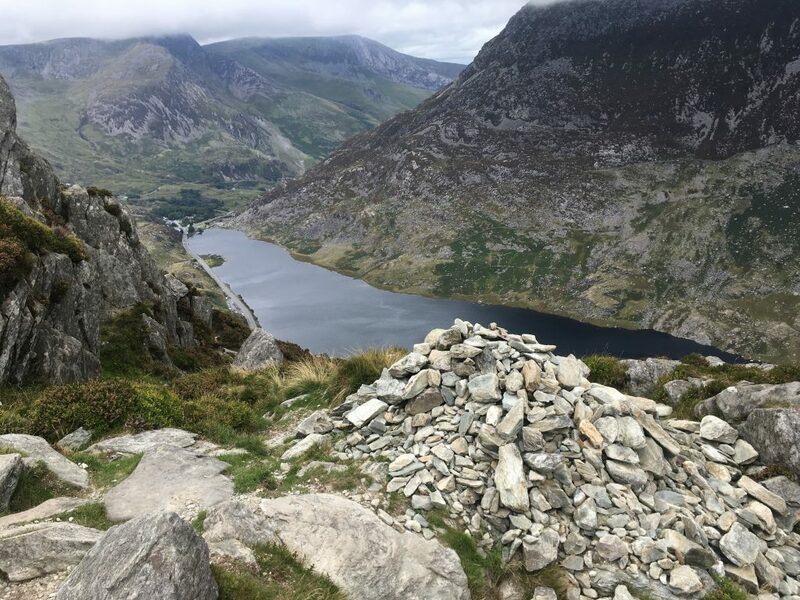 The main issue, however, is that the quantity of ashes scattered on the highest and most accessible peaks, like Snowdon, where the summit is accessible via train, mean that the delicate ecological balance is being upset. Make sure loved ones know that you do not want a memorial plaque or your ashes spread on a mountain. Sensitively challenge friends and family who do. Cairns are piles of rocks. They differ from rock-stacks as they serve a purpose by marking a route. Now, I’d be lying if I hadn’t been glad to see a cairn looming out the mist whilst trying to descend a complex route at the end of a long day. However, overly large or excessive cairns remove the feeling of wildness on the hills as well as the chance to use navigation skills. If you are relying on cairns to get about the hills, I’d argue that you are probably not working within your skill level. Especially in the UK where we are blessed with such good maps. Ben Nevis is a case in hand. Large cairns were built by the Nevis partnership to aid navigation on and off the summit, but over 120 Cairns were removed, which were said to be ‘unsightly’ by the John Muir Trust. 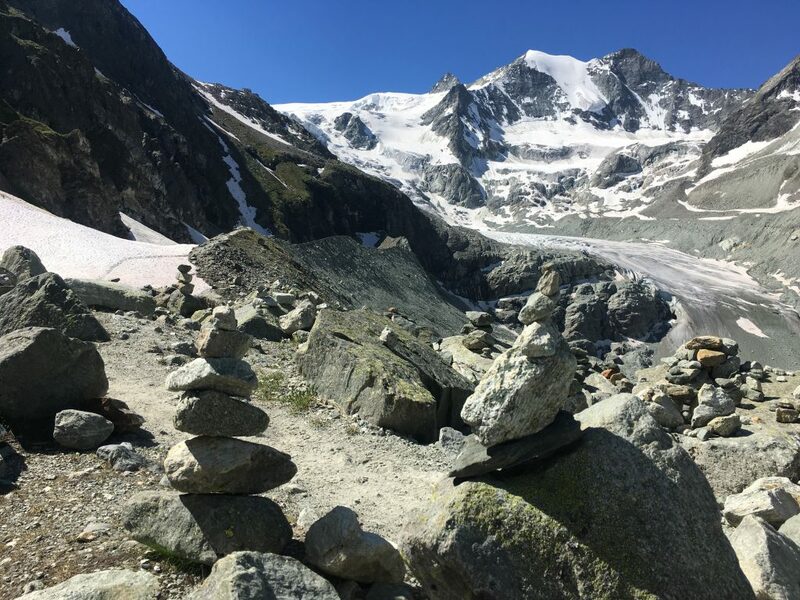 People also mistakenly add to cairns thinking that it is helpful, however this means that some cairns were so large that they block paths and become unnecessary eyesores. Do not to build new cairns or add to cairns to make them larger. Orange peel and banana skins are biodegradable, right? So, why isn’t a problem to discard them on the hill. Well, although they are biodegradable they take a long time to breakdown, especially in high mountain environments. Mike Raine (author of ‘Nature in Snowdonia’) did an experiment with banana skins in North Wales and found it took over 6 months to degrade and, at 200m, extrapolating to higher elevations this process would take longer, potentially up to 2 years. The fact is that, especially on mountains which have hundreds or thousands of visitors each year, if everyone left their banana skin and orange peels bhind we’d be knee deep in them. Even in quieter places the brightly coloured peel is as much as an eyesore as other litter. There is also potential for ecological damage as it could encourage foreign species to an area. If it doesn’t grow there don’t throw it there. Do not bury any food waste or wash pans up directly in streams. Take all food waste home. Having some nappy sacks or, better, a reusable container like a Tupperware, means that it is easy to do. Our digital trace is the most conceptual of all the practices I’ve chosen to highlight. Digital trace is not yet part of the Leave No Trace principles, but should we consider it? Social media posts, especially those with specific GPS locations, have been connected to increased footfall and ‘honeypot-ing’ of sites which has directly led to environmental damage. I’m still weighing up the pros and cons of this, but it’s something we as a community need to think about. I have always considered what and how I share things on social media. I never share the exact position of my favourite van or wild camping spots, and when I was asked to write an article on my hidden gems in the outdoors I wrote this instead. Think about what you want to share and any impact on the place before posting. Consider not sharing exact locations. Use social media for positive change like highlighting environmental causes.